Forex Entourage provide no information on their website about who owns or runs the business. The Forex Entourage website domain (“forexentourage.net”) was first registered on July 16th, 2013. The registration was recently updated on July 14th, 2017. Sawicki Tomasz is listed as the owner, through an address in Roubaix, France. Further research reveals this address has been used to register multiple website domains, suggesting it’s virtual in nature. Forex Entourage provide two corporate addresses on their website, one in the US state of Utah and the other in the UK. A BBB listing for Forex Entourage LLC was created on December 15th, 2016. The Utah address provided for Forex Entourage LLC in the BBB listing is different to that of their website. 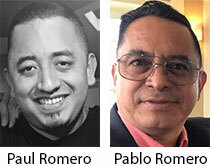 The Forex Entourage LLC BBS listing cites Paul A Romero as “Managing Member” and Pablo Romero as “Coowner”. These names lead me to Forex Entourage’s Instagram account, which names “Paul Rome” as CEO of the company. Romero goes by his actual name on Facebook, as does Pablo Romero. Both their Facebook profiles cop out in early 2016, revealing nothing about their MLM or forex histories. Forex Entourage markets a range of forex related packages. Forex Entourage pay affiliates to sell forex packages to retail customers and recruited affiliates. A monthly ROI is also paid out via a binary compensation structure. Forex Entourage pay residual commissions via a binary compensation structure. At the end of each month Forex Entourage tally up sales volume on both sides of the binary team. This metric is used to assign each Forex Entourage shares, which pay a guaranteed “lowest income” minimum commission each week. 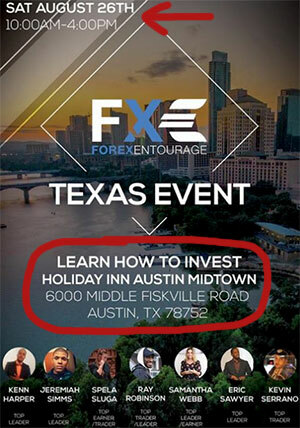 Note to qualify for residual commissions a Forex Entourage affiliate must personally recruit at least two affiliates. All Forex Entourage affiliates must also pay an additional $10 monthly fee. When you start talking about “shares” and monthly payouts, you’re obviously paying a ROI. Despite Forex Entourage’s murky company ownership and management, a corporate address in the US is provided. Furthermore Alexa estimates that 80% of traffic to the Forex Entourage website originates out of the US. Offering an investment opportunity from the US and/or to US citizens requires registration with the SEC. A search of the SEC’s Edgar database turns up nothing for Forex Entourage or any derivatives. This means Forex Entourage’s MLM compensation plan is an unregistered securities offering, in violation of the US Securities Exchange Act. Whereas manual trade signals are fine, Forex Entourage’s automated trading is also a securities violation. Hands Free Trading! Let our expert advisor do all the hard work for you! From a regulatory compliance perspective, Forex Entourage membership holders invest money and receive a passive ROI based on the efforts of others (literally the definition of a security). That’s two levels of potential securities fraud, should the SEC launch an investigation. Outside of that there’s also the potential for Ponzi fraud, as the monthly shares are tied to affiliate fees and not trading activity. Affiliate fees are fixed every month, meaning Forex Entourage affiliates are simply paying a fee and receiving a “share” of everyone else’s fees each month. The share payout is based on how many people join after, highlighting the Ponzi aspect of the business model. 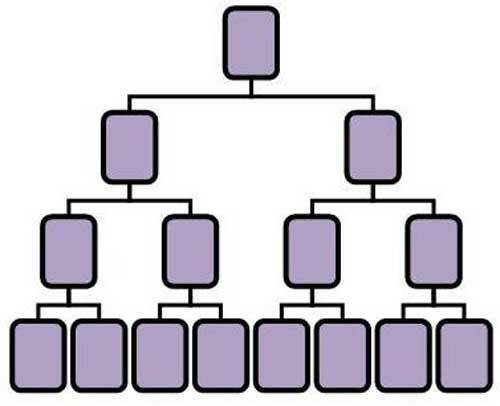 There’s also a pyramid element to it too, as without recruitment of affiliate’s who pay a monthly fee, Forex Entourage has little to no revenue to pay share dividends with. A token effort has been made to encourage retail sales, by way of monthly affiliate fees waived if double the points of the affiliate’s package are generated through retail membership sales. In a legitimate MLM opportunity I’d highlight this as a positive, but with securities, Ponzi and pyramid fraud taking place – those issues cannot be ignored. The bottom line is if Paul and Pablo Romero were able to consistently generate revenue through forex trading, sharing such a large percentage of it through an MLM compensation plan makes no sense. Unless the forex trading is nothing more than a ruse, with the Romeros making most of their money through shares. Either way the Achilles’ Heel of Ponzi and pyramid schemes is a drop in recruitment, which will cause Forex Entourage to collapse. Ponzi math dictates that a company can’t pay out more than is invested, which will ultimately result in the majority of Forex Entourage affiliates losing money. Utah Corp search says they did start the registration back in 2014, but forgot to renew it in 2015. They did it again in 2016 and is now current New enttity ID 9574841-0160, registered by a Mr. Pablo Neftaly Romero. It gave an address on Sunset Blvd in St. George, probably the one you saw in BBB reg. It claimed its business is “other information services”. Apparently, it’s going to stick to “we just sell forex signals” story. They are in danger of losing their UK reg as they haven’t filed an update that’s due more than 3 weeks ago. Tsk tsk tsk. The UK branch listed a second owner as “Zachary Pryde Duffy”, with total capital of 100 pounds. Yes, 100 GBP. He resides in Hurricane, UT. Yo: "So those thousands of founders will simply watch this scumbag walk away into the sunset..."